Miss Snark, the literary agent: Let's do the Time Zone again! Let's do the Time Zone again! Thank you for your enlightening blog...it's rather addictive! The advent of the net and electronic communications has made communicating with authors living in far flung ports of call a lot easier. I have a client who moved to Canada between the time I took her on and sold her novel. Surprise! She was smart and kept her US bank accounts though, and files US taxes. I have no idea what she does in Canada. As long as you can get reliable internet service and you have a computer that generates files I can download and print, we're good. The problem is of course, you're REALLY not available for touring nor for much promotion at all. Even if you can't leave your house in beautiful downtown not-NYC, (see post NO TOUR NO WORRY) you can be "on the radio" by phone. That does NOT work if you live in beautiful downtown not-USA. Donna Leon lives in Italy full time and is published here, so it can and does work. I can't think of any others off the top of my head but I bet there are. The good thing is that if you're writing about Japan you've got a much better opportunity for close observation and fresh writing. I think Miss Snark makes some assumptions here. Just because you live someplace else doesn't mean that you're not available for touring. If a writer is willing (probably at his own expense) to get to the US, from that point on a book tour is a book tour. Yes, if you've got internet access and can get your work to your agent and editors via email, you can live anywhere. I've been interviewed for radio shows via phone from other countries. It might make things tricky for live interviews (you may have to stay up late or get up early), but it's not impossible or uncommon. Pre-taped shows are even easier to schedule. Besides, it's kind of fun talking to some big-city host while you're sitting at home in your fuzzy slippers (or fuzzy stilettos). Following something similar to Miss Snark's client's example, if you had a Canadian agent and you maintained a bank account in Canada, you'd probably have the least amount of trouble working from Japan. I'm not sure of the amount of paperwork involved for a Canadian citzen who has a US agent, but I'm sure that most agents have standard procedures for dealing with that sort of thing. If the writing is wonderful, the voice compelling, and the agent feels he/she can find a home for it, then all the other crap can be delt with as need be. Litagent is right. If you're slated to go on a tour and you can get to that country on your own steam, then it's all systems go. On a related note, there's a wonderful article at Book Ninja this week about writers who choose to live in isolated areas. Here's a link to it and a link to my response at Incidental Pieces. Yes, I have to say I know quite a number of authors who live in other countries, in Australia in particular, who have agents and publishers based in New York, and no problems whatsoever. The tax bit is exactly as simple as litagent says, and communication isn't that much of a problem. There's more where that came from too! Should a novelist start a blog? Live and In Person! Miss Snark! Ist das die zug nach Lake Como? 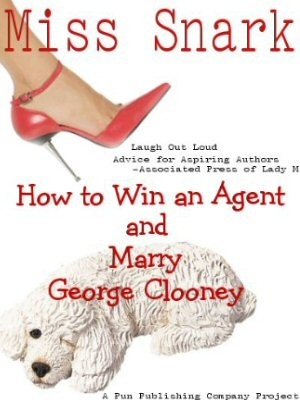 Further on "Firing Your Agent"
Do you like Miss Snark? Miss Snark Reprimanded by Snarkling!!!!!!!!!!!!! When am I really really rejected?